Don’t let vacation go to waste….do some coloring during those lovely quiet times with your family! Make your summer vacation an art adventure too! Encourage your kids, grandkids, nieces and nephews to create, and innoculate them against the naysayers in their future. 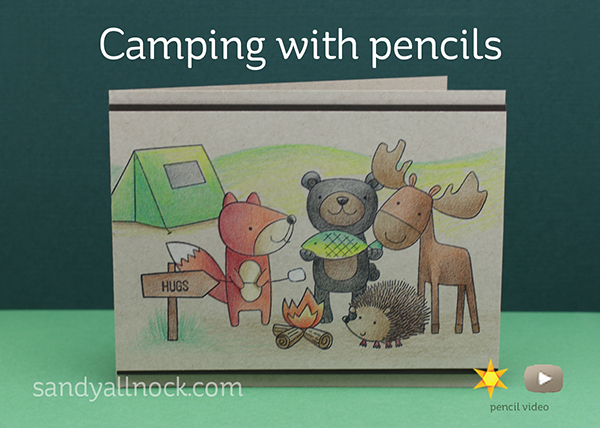 While I color this camping image in colored pencils, I’ll give you some ideas to share art with the littles in your life! Watch the video below or click HERE to see it in HD on YouTube. What to pack for coloring on vacation? Suggested supplies would be 1) your medium – colored pencils are often easiest, least messy. 2) something to color, prestamped; 3) pencil sharpener (hand powered); 4) a hard surface like a mini clipboard; 5) coloring books. Take things for the kids to work on too – new coloring books and a fresh box of crayons are a real treat! You can even download and print out color wheels for a fun art lesson while you’re on your trip and coloring together. If you learned about shading from the Copic Jumpstart Class, why not share that with kids? 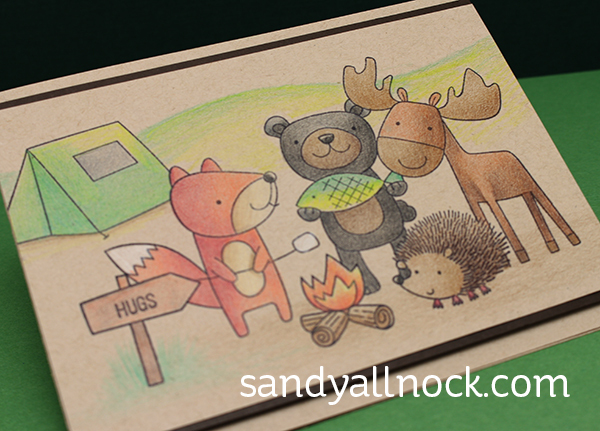 Wow, Sandy, your pencil colouring looks amazing! I really enjoyed watching you colour! I like your advice too! Your video is timely because I’ve just put together a pencil colouring kit, not for camping, but for “waiting” (appointments, etc.). I took it with me last week and I hardly got any colouring done because my husband’s doctor was actually fairly close to being on time. Usually we sit there for 2 hrs and this time it was only about 20 min – very unusual! This is just adorable. As always, you are tremendously inspiring! We have a lovely camp in the woods by a peaceful river and this is exactly what I do! There is no power there so I take lots of things to color, my camera and I have a well stocked book case! I keep plenty of things there as well for our grandsons as we feel it is important for them to learn to be creative in art as well as in other areas. So much cute on one card! Thanks Sandy! Love the card and tips.